It’s time for a new challenge over at AAA Cards and this fortnight we want to see CAS cards inspired by a TV show. Our sponsor is Stamplorations. I confess I found this theme a bit of a challenge… but then I remembered the fabulous Friends-inspired stamp set by The Ink Road. I absolutely LOVE the TV series – even though it ended over a decade ago, I still enjoy watching it to this day. And of course so many iconic lines. As you can see, I couldn’t stop at one card – there are so many fun lines included in the set how could I possibly choose just one?! I started with the ‘moo’ comment by Joey. I knew I wanted to pair it with a cute cow stamp, but you know I discovered I only have a couple of cow stamps! I ended up using a Penny Black stamp from an older ’12 Days of Christmas’ set. I love how versatile that set is – the images can be used all year round! Anyway, once I’d stamped and coloured the image, I felt my stamping needed to be ‘grounded’, so I used a rectangle die with a rubber mat to emboss a border. A fun technique to add a little something extra to CAS cards! I decided to use the ‘lobster’ quote for my second card. I always remember Pheobe explaining that lobsters mate for life…. and when she gleefully exclaims at the end of the episodes ‘he’s her lobster!’ as Ross and Rachel kiss. I’d completely forgotten that Ross does actually say ‘you’re my lobster’ to Rachel earlier in the episode in a typical Ross manner! I kept it simple, stamping with Altenew inks and adding a few die cut hearts to finish off the card. My final card uses a line from one of my favourite scenes from the entire series – when Ross, Rachel and Chandler are trying to move Ross’s new sofa into his apartment. So funny! It makes me giggle even just thinking about it! Anyway, if you know the scene, you know Ross’s sofa was white, but I decided to use the sofa in Central Perk as my colour inspiration! The ‘pivot’ stamp is stacked, but I wanted a horizontal sentiment… So, I lined the stamp up on my MISTI, masked off part of the sentiment and then moved the card a couple of times in the MISTI to create the horizontal sentiment. 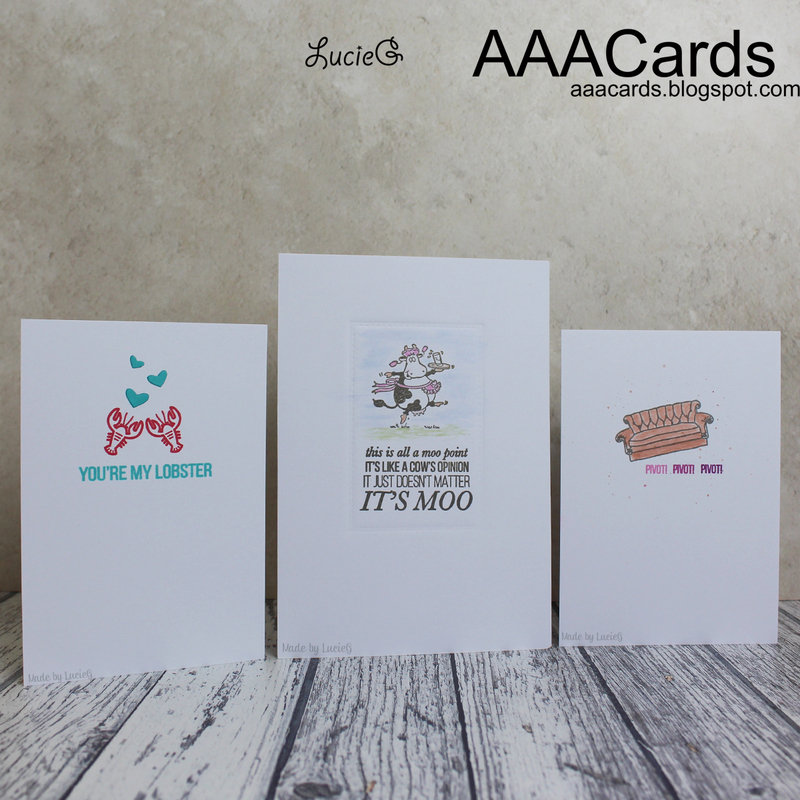 My teammates have shared some gorgeous CAS cards on the AAA Cards blog and we are also joined by our wonderful sponsor, Shery, plus the super talented Alex. She has some fabulous creations on her site!